Should Backbends Always Be "Smooth and Even"? Teachers, the next time your students are doing a backbend, like cow pose (bitilasana), pay attention to their spines. What do you see? In the photo above, can you see the discontinuities in the lower back indicated by the arrow? Look for where the straight lines change directions. There is a second, smaller hinge just above the big one. You may have been taught that the spine should have a smooth curve, with each joint contributing equally to the curve, like a string of pearls. That is an aesthetic ideal, fostered by anatomy books that show a nice, even amount of space between each pair of spinous processes of the vertebrae. If the anatomy book shows a body that can do smoothly curved backbends, why shouldn’t your students do the same? If they don’t, you may believe it’s because they’re not trying to even out the curve—or they’re just not paying attention to your great guidance. Unfortunately, achieving this aesthetic ideal is quite rare, though it does exist—see figure 2 below for an example. But then look at figure 3. These three students show marked hinges; they may have the same amount of extension in the lumbar as the student in figure 2—indeed, the student in figure 3b can grab her feet and lift high—but each individual gets there by very different means. Is hinging safe for them? Figure 2: This yogi has an even curve along the length of the spine, with no obvious hinging. Figure 3: These yogis all exhibit extension hinges at various places in the lumbar spine, as shown by the red arrows. The hinge for (a) is probably at T12/L1. A high hinge can also occur at T11/T12. For (b), this low hinge is likely at L5/S1. For (c), there is a slight hinge at L2/ L3 and a deeper hinge at L4/L5. 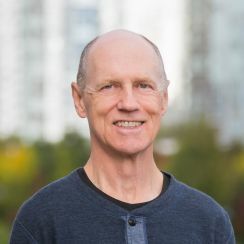 Let’s define the term “hinge.” According to spine biomechanic Stuart McGill, “[h]inges are motion segments that bear more [than] their share of the motion.”1 They are discontinuities in the curve of the spine, and that is the clue for spotting them. Often the spine in general is quite stiff, but occasionally there is one joint (sometimes two) that is quite mobile, so movement tends to occur only at this point. Many teachers feel a hinge is a “call to action,” signaling that the person should recruit other areas of the spine into use, in order to ensure that the hinge area does not become a problem. Using the whole length of the spine is a worthwhile objective regardless of whether the hinge is inherently dangerous or not. However, very rarely does a student have the ability to move a single vertebral joint. Just as it is rare to be able to activate one muscle in isolation, it is rare to be able to move one vertebra without moving many others. Perhaps some highly trained dancer or contortionist has developed this skill, but most of us can only move the lumbar spine as a whole. Thus, the intention to “smooth out the curve of the spine” may happen over several vertebrae, but it will not occur at each individual joint. Hinging can occur in all movements of the spine: flexion/extension, lateral flexions, and even twists. For some students, extension hinges may be perfectly normal and safe movements. This can be okay, and preventing students from using their natural range of motion could cause the joint to atrophy due to a lack of stress. Some students definitely should be allowed to hinge, but this does not mean it is a good idea for everyone! If a student continually creates her backbends by hinging where it is easy and doesn’t develop an optimal range of movement in the other spinal segments, she runs the risk of overloading the hinge joint. This overload situation often occurs during dynamic movements or when the spine is bearing a large load. Over-stressing any single joint is not good, nor is it good to over-stress a hinge. A hinge may be present because of a structural failure or pathology at that joint, such as spondylolisthesis, and in that case it may not be a good idea to allow the full range of motion there, even though it may be easily accessed. What should you do as a teacher? Allow the hinge or not? If you discourage the student from using her full range of motion, you may be denying her the full experience of the backbend. But if you do encourage hinging (either through a deliberate choice and a desire to have the student deepen her backbend, or out of ignorance of its existence), be aware that some students may risk damage to that joint when they repetitively subject it to hinging. There is the risk of the “credit card effect,” in the same way a repetitive back and forth movement applied to a credit card will eventually break the card. That may be a good thing to do to your credit cards, but it may not be healthy for your spine.4 Students with a distinct extension hinge may find it healthier to back off a bit. But again, for a few students, denying them their full, natural range of motion may cause that joint to atrophy. In cases like these, where no single answer can be dogmatically applied to every student, it is useful to return to your intention, and to the student’s intention. What are you hoping to achieve by offering the backbend posture in the first place? Is maximum range of motion really necessary, or is it only an aesthetic goal? When I see an extension hinge, I have two questions: “What is the intention of this pose?” and “How does this student feel?” If the student has pain, she is too deep regardless of the intention. If there is no pain while she is in the pose, but she feels pain when coming out, or even over the next day or two, she may have gone too deep. If she is a gymnast or dancer, maybe a deep, aesthetically pleasing appearance is okay—but she should be the one to decide that, weighing the risks and rewards for herself. The higher the speed of movement, or the larger the load being borne, the greater the risk. Regardless, it is always a good idea to see whether she can also recruit more range of motion in other areas of the spine, in order to reduce the stress in the hinge. And it is always a good idea to seek stability throughout the whole range of the spine, especially in the region of the hinge. Stability comes from stiffening. Stiffening the spine will reduce the range of motion in any backbending posture, but it will also prevent the spine from going too deep—to a point where injury may occur. A hinge that occurs in flexion is subtler and harder to detect than an extension hinge. Again, we look for a discontinuity in the curve of the spine. 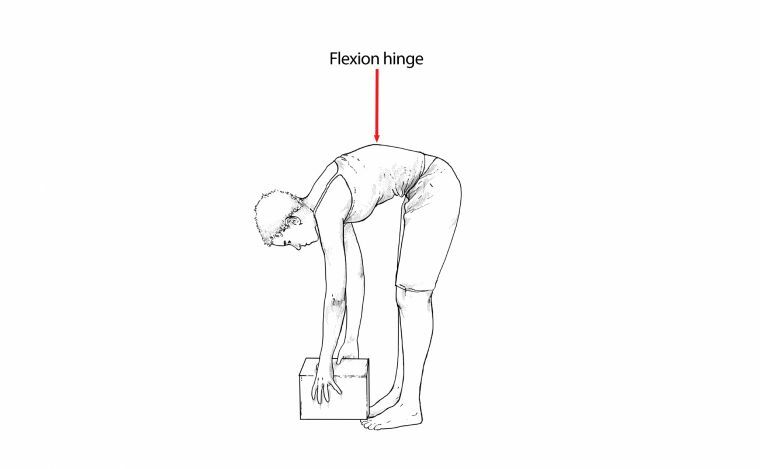 Figure 4 shows a flexion hinge occurring in a standing forward fold, but this can occur anytime we flex the spine. Figure 4: A noticeable flexion hinge. Since flexion hinges occur at regions of joint instability, it’s advisable to buttress the joint to prevent dysfunction and pain.5 For thoracic and high lumbar flexion hinges, one good idea is to engage the latissimus dorsi, because they enhance torso extension. Hinges in the lumbar are more effectively buttressed by stiffening the abdominal muscles.6 Stiffness is stabilizing, so we engage the musculature around the spine to stiffen or “brace” the hinge. One cause of hinging is a regional stiffness along the spine; so another treatment option is to increase mobility along the spine in areas other than where the hinge is occurring. Cat-cow (marjaryasana/bitilasana) movements focusing on the full spine can be helpful; draw the student’s awareness to the hinge location and ask her to keep that area quiet while enhancing movement everywhere else. Harder to detect are torsional hinges (twists) where most of the twist is coming from one joint, rather than having all joints contribute to the twist. Similarly, a student may have a very deep side bend to her spine, but when examined closely, most of the side flexion may be occurring in just one joint. Asymmetric hinges can also occur where a student can twist or lateral bend better to one side than the other. These hinges may be caused by difference in the stiffness of one side of a disc, or by the shape and orientation of one particular pair of facets. Again, hinging may be totally fine for some students but a problem and a source of pain for others. Attention is required, along with the intention to have each spinal joint contribute to the movement, to the degree that it can. 1. See Stuart McGill, Low Back Disorders: Evidence-Based Prevention and Rehabilitation, 2nd ed. (Champaign, IL: Human Kinetics, 2007), 202. 2. See McGill, Low Back Disorders, xi. 3. A hinge is not automatically a problem. Let’s assume that a student has a pronounced hinge that allows her to go deep into the wheel (urdhvadhanurasana). Many teachers may not even notice the hinge and will be happy to see that this flexible student can easily drop back into a wheel with hips high and arms straight. But a few teachers may look more closely at the spine, see the hinge and offer some guidance along the lines of: “Hey, did you know that you have a hinge in your spine? Yeah, right about here… [touching the hinged area]. You’re using this one joint for your full extension. Let’s work on recruiting other joints along the spine as well, because if you keep using that one joint, you’ll damage it.” Everything up to that last bit was good, fine, useful information, but that last bit in italics? That was speculation. Just because someone has a hinge and uses that hinge does not mean that they are damaging their spine. We don’t know whether there is still more range of motion available at that hinge or not. Maybe it is at its limit and the full stress of the backbend is shearing those two vertebrae apart—which would be bad. But maybe she still has lots more room there and is not in danger at all. A hinge is not bad, in and of itself. Also, while an overstressed hinge may be bad, using fear to change her behavior is not an appropriate teaching technique. Instead, invite an investigation into what is appropriate for her, given her unique biology and biography. There is no problem with encouraging this student (or any student) to use the whole length of the spine when doing a backbend. That’s cool. Do it. But don’t play the fear card or assume that a hinge automatically means trouble. 4. Fortunately, our spines are not credit cards; we can get too carried away with such an analogy. Living tissues have the ability to adapt and become stronger from repeated stresses, provided sufficient rest is taken between episodes. The spine needs more rest than other joints of the body. Too much stress is bad, though. How do you know if it is too much? Pay attention to how the joint feels—in the pose, after the pose, and in the subsequent few days. 5. See McGill, Low Back Disorders, 54, 202 and 203. 6. See McGill, Low Back Disorders, 202.